By now you know I’m all over the place here. One day I’ll write about music, the next time it might be a simple quote. And we all know about my Pinterest addiction. 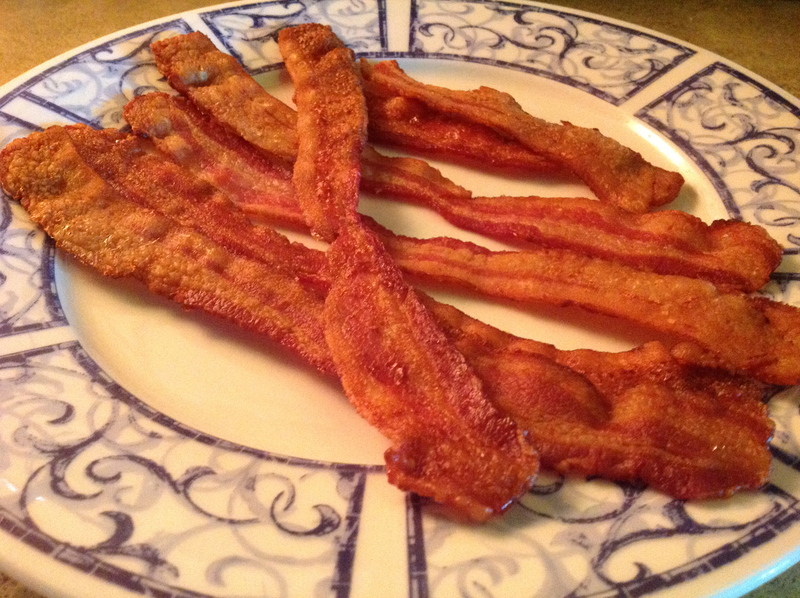 Its because of that pinning obsession that I give you my take on, wait for it… … … bacon. My love of bacon probably borders on sinful. I know that I could easily eat it three times a day. I also know that I would kick off three times quicker if I did indulge as much as I want to. If I was an intelligent woman, I would stay completely away from it but thankfully, no one has really considered me to be overly smart. So I limit myself to once a week, which considering the evils of bacon, is still probably too often. Now on to the point of this post. I’ve been seeing a lot of “pins” on cooking your bacon in the oven and thought I would give it a try. And boys and girls… I’m sold on it as I have a love/hate relationship with frying bacon on the stove top. It’s the smell. It smells wonderful while cooking, that sweet aroma wafting though the house but a couple of hours afterwards, not so great. My stove can’t seem to find the optimal cooking heat. Either too low and I’m standing there foorevvverrrr to get it to the crispness I must have or so hot that I need an amour suit to protect myself from splattering bacon fat. Then there’s the de-greasing of the stove. And the vent. And the counter. And really anything in a three and a half foot radius of the frying pan. With cooking bacon in the oven, all my problems are solved. With cooking it in the oven, you get a very faint whiff of the good stuff, just enough to make your tummy tickle but not strong enough to still be able to smell it hours later. And no standing at the stove, turning it over, no trying to keep it flat and evenly cooked AND no splattered mess to clean up. So simple… grab a cooking sheet and line it with aluminum foil. 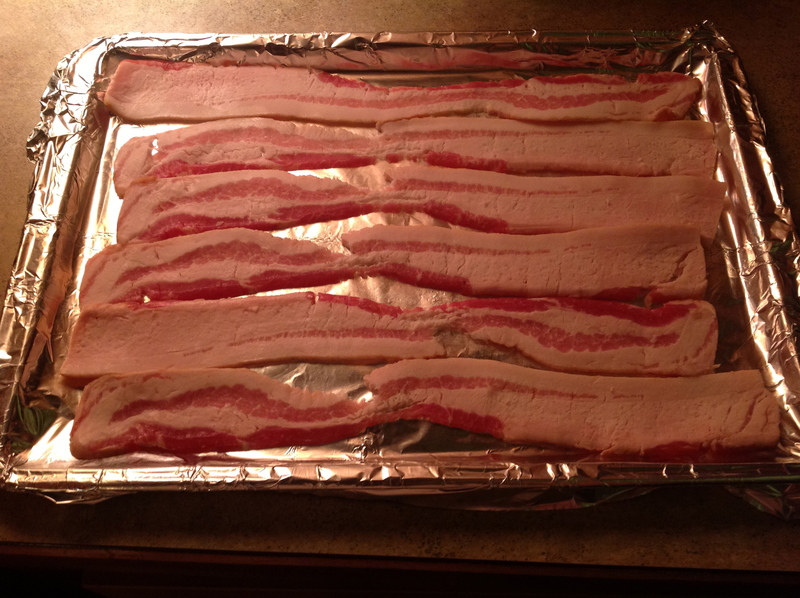 Lay out the bacon and slide it into a cold oven. Turn said oven on to 350°, wait 20 minutes (less or more depending on how you like it) and there it is. Perfect bacon. Of course when you take it out of the oven, its swimming in the clearest, cleanest bacon fat you’ll ever see. Once you drain in on some paper towels, give it a couple of pats to get any remaining fat off, its perfection will make you drool. It’s cooked perfectly through, no extra crispy spots next to a rubbery, raw, curled up piece. There’s no grease splattered in the oven and clean up… stand over the trash can and take the foil off and throw the cookie sheet in the dishwasher. Can’t get any easier than that. This entry was posted in Just me, Luscious Goodies, Random, in other words, nonsense and tagged Aluminium foil, Bacon, breakfast, cold oven, Cook, Cooking, Dutch oven, Food, foot radius, frying bacon, Oven, Paper towel, Pork, sweet aroma. Bookmark the permalink. Everything you love about the original, but now in 1/2 inch extra-thick slices! With the popularity of bacon and the dangers of it, (I think bacon kills more than responsible gun owners) I predict there will soon be a government ban on it.